Mother Nature’s beautiful and mysterious ways have been caught on camera by a professional photographer who has captured time-lapse footage of a powerful rainstorm over a lake in Austria. The video, titled ‘Tsunami from Heaven’ shows blue skies turning grey as rain clouds swoop in over Lake Millstatt in Carinthia, Austria. 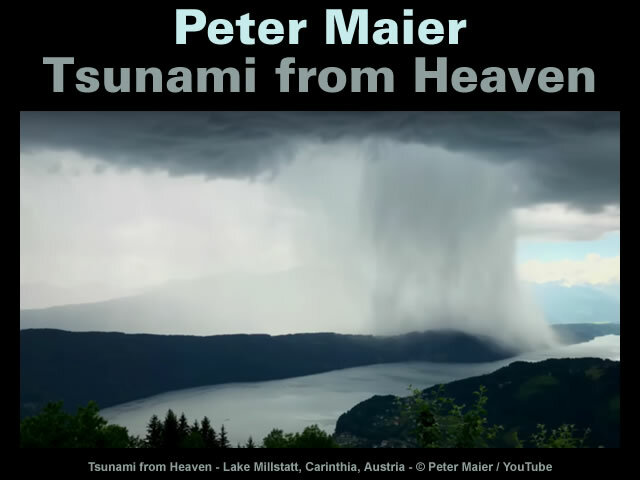 It doesn’t take long to see why photographer Peter Maier gave the video its title, as the downpour of the rainstorm does indeed look like a tsunami coming from the heavens. Gallery | This entry was posted in Atmospheric Science, Water. Bookmark the permalink. Rather spectacular videos but calling them tsunamis? The real issue is that academia has added Settled Science to that long list of synonyms. It is quite normal. Traveling home last autumn, one such downpour was visible. In the space of two miles I entered the cloudburst, which refilled my reservoir, and exited to bone dry roads. This is central Med. The condensation of water vapor to produce rain give out heat (latent heat of evaporation), but burning hydrogen gives much more. Yet the rain remains bl**dy cold. The simple answer fits best.